Greetings fellow traveler. We’d like to pose a mission of sorts for your next vacation to Cuba. Call it a challenge, call it an opportunity, or call it a riddle. Whatever you’d prefer. All you need is a sense of adventure and wide open eyes to navigate the terrain. Ok. Let’s get to the point. Traveling in Cuba as a local versus a foreigner is a whole different ball of wax, but you came and asked for the real Cuba, correct? Here’s a guide to get you started. For starters, we ask you to structure your trip using only “moneda nacional,” that is the term for local pesos, versus the tourist money (aka Convertible Pesos). For the diehards in this experiment, we ask you to consider the monthly wage of an average Cuban, that is, approximately equivalent to $20-$50 a month. Let’s assume you saved money all year long, and have only $10 to spend a day (and that is highly generous for what most Cubans spend on one day’s vacation). Therein lies your challenge, to enjoy the fruits of the island, on this stipend per day. If you are coming from the United States, bring items that are valuable to sell (batteries, USB sticks, old cell phones, etc). Most Cubans have a side hustle in addition to their regular job. When you are low on cash, now you have some black market goods to sell to strangers. Remember, in Cuba, it’s all about alternate forms of income. In order to melt into the atmosphere, it is impotent to use local colloquial language. When approaching a Cuban to begin conversing, muster all confidence of a Cuban and belt out “¿Qué bolá? !” which is the equivalent of “Wassup?” So commonly spoken is this phrase that President Obama used these words when greeting local comedian Pánfilo on National Television. Instantaneously, Cubans drew a laugh and nodded their heads in approval, almost as if Obama now has “Cuban cred.” The other oftenly used word is “Asere” which translates exactly into “Brother”, as in “Asere, ¿me puedes decir la hora?” (Hey Bro, can you tell me the time?). Sometimes it can be used in all multiple tones to express anger or love. It usually depends on what type of emotion you throw behind the word. If you’d like to continue this task with utmost authenticity, you’ll promise to avoid big hotel lobbies, with all its Western toys, gift shops, and accessible products. Instead, stick to the public Wifi Parks to check all your emails, or at the very least, stand on the sidewalk beside a hotel, which is where all the true locals maximize a Hotel’s Nauta reach. To chat online like a resident, download the app IMO before arriving. For some reason, it is the strongest video chat to be used in Cuba, sort of like Cuba’s version of WhatsApp. All those times you see Cubans laughing or crying in the park with a mother, brother, or lover, approximately 99% of the time, they are using IMO to relay their most intimate feelings in public. You will be able to purchase black market NAUTA cards at the parks by keeping your ears open to a wandering stranger’ s whisper, “Tarjeta de Enterrrrnet”. For transportation, you’ll need to zip around town at lightning speed, but must forsake the convenience of a yellow taxi parked in front of major hotels. Instead, you will become familiar with the local transportation, also referred to as “Máquinas.” These old vintage cars shaped like an almond (thus the reason for its nickname “Almendrones”) ride up and down specific streets only. I like to refer to them as Cuba’s subway system, although these cars are above ground. For example, if you stand on Neptuno Street, on the tip of Prado in Habana Vieja, just put your hand up in the air when you see an old car drive by. How will you know? Most likely, the car will be packed with bodies. With a little patience, waiting, and smiling, the right car will eventually pass by and scoop you up. Slowly you will learn the main avenues for Máquinas (Línea, 3ra Avenida, 23rd St, etc). If you ride across town, from Havana Vieja to Miramar, the ride will be 10 pesos (approx half of CUC1). If you you go beyond Vedado and past the Miramar bridge (for example, a journey from Havana Vieja to Siboney, the ride becomes $20 pesos (almost 1 CUC). this means your transportation will not be destroying your new budget. For a true experience, I assign you to ride a large bus at least once in the week. Standing like sardines in a packed bus is the ultimate Cuban experience. Buses cost 40 cents of a peso (less that 2 cents of a CUC!). Now that you know how to get around, find a local party. I’m not talking about the air-conditioned VIP rooms at Factoría de Arte Cubano catering to foreigners. No, I’m talking about the down and dirty pastimes. Free is better for a local Cuban. 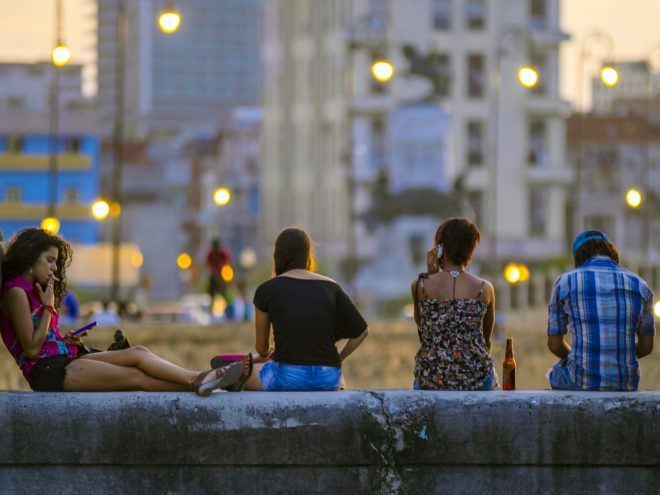 Purchase a bottle of rum and walk to the Malecón, Havana’s biggest couch, and begin your “people-watching.” Subcultures tend to cloister on specific blocks. Some have cute hetero kids, some are the gay blocks, and some are just quiet corners with privacy to chat with an old friend. What is your flavor? Pick your block by walking all up and down the Malecón on a Friday night. This night of partying will cost you $1-2 if you share a bottle of rum. Another street to spend a weekend evening is Calle G. The tree-lined promenade welcomes independent thinkers, otherwise known as “freakies.” A bit Bohemian, a bit skateboards, and a bit rockers, this street gravitates the artistic freaks, and there is never a dull night on this avenue. It is intersected by 23rd and Línea streets, both main avenues for the “Máquina” cars to drop you off. See how it’s all coming together? This leaves us with the limitations on where to sleep at night. Remember, in this experiment, you are not allowed to rent a room at a major hotel. If you choose to book Airbnb, you must stick to the humble budget. Truth be told, most Cubans scour the website Revolico for rentals. The site is sort of a Cuban version of Craigs List, filled with listings ranging in apartment rentals, tech needs, and shopping. Revolico has two different price ranges for renters: one is for foreigners, and the other is for locals. Your challenge will be to find a place within the local offerings. You may need to enlist a Cuban friend to rent for you, since most renters will shun you upon discovering you are an “extranjero” (foreigner) renting at local rates (this is easily explained by the amount the renter is paying for a license to rent rooms or apartments as a self-employed worker). Ready to hit the beach? Forget to fancy Yacht Club that charges $10 per entrance fee, with all its five-star service and wooden reclining chairs. This time, you are going to the locals’ beach in all its raw glory, and packing your own lunch, beers, and beach chairs. Santa María, loved on the Playa del Este coast, is a good start. While you are at it, bring your iPod and power speaker, and blast those tunes on the beach. You may start a dance party on the sand. Expect to clash with the surrounding reggaeton tracks blasting out of a neighbor’s towel as well. Just sit back and soak in the breathtaking beach and locals wafting around, almost like a nightclub in the daytime, except the men and women have less clothes on. Children run amok from towel to towel, making this Cuba’s favorite pastime for the whole family—a hot sunny day mixed with cold beers. Now, what about Food? Well, this category seems to be the most delineated topic of conversation between locals and foreigners. If you have snobbish tastes of an American foodie, this part of the experiment will be your biggest concern. Your budget will not allow for fabulous daily dinners at Riomar or Otramanera, two deliciously culinary paladars enjoyed by tourists or wealthy Cubans. Street vendors instead offer pizza (at times, appearing like frostbitten frozen foods), croquettes (hit or miss), or hamburgers (not the typical robust American burgers with fixings). Some peso dinners are surprisingly tasteful and golden finds. It’s a bit of a roulette game, with an ounce of instinct. There is one saving grace in all this chaos—the farmers market. Keep an eye open for fruits or vegetable markets all around Havana Vieja, Centro, And Vedado. Typical finds in Cuba include Pineapple, Guava, Eggplant, Malanga or Taro, Bananas, Plantains, and Cucumbers, among other things. All these products cost roughly a few cents in pesos. The famous spice store on Mercaderes (in Habana Vieja) offers a treasure trove of Spices from Cinnamon to Curry. Some local markets sell simple pasta boxes and fresh fish. Now, imagine how creative one can be with that. After you’ve mastered the art of simple living, you are ready to venture outside the capital. Remember you are not allowed to rent exorbitant REX cars ($80 a day), nor reserve a tidy vintage car with driver. One option is a nice scenic trip outside Havana via train. A classic electric train leaves from Casablanca (just a ferry ride away from the Havana Harbor) towards Matanzas, making this a scenic 4-hour train ride. The Viazaul buses are probably the biggest provider of transportation all across the island. Just to compare fares, a foreigner can pay up to $200 CUCs to reserve a private driver for a full day drive to Varadero, roundtrip. Instead, take yourself to the Viazul Bus Station in Nuevo Vedado and reserve a ticket on the Varadero bus for only $10 CUC (note: the buses are air-conditioned too). Once hopping off the bus, just stroll the streets of Varadero looking for the famous Renters Logo (resembling an upside down anchor) which indicates the Cuban resident is renting rooms in their home. If you negotiate tough enough, you may find a home for $10 a night. Other local venues that Cubans take their families to are the Seaquarium, the Circus, the Natural Hot Springs, and Baseball Games. If you find yourself in Santiago (the other side of the island), try hitchhiking on a “camión” or “camioneta.” The buses are harder to locate, so most trucks will stop and pick you up. Beware, they could get packed to the gills, and safety is not high on the radar, but this was the adventure you asked for. If you wander outside of Havana, the two most important things in your arsenal of necessities is a roadmap, and the functioning ability to speak Spanish. If you can’t defend yourself using Spanish, we suggest you stick to the Havana area, where a decent percentage of residents can maneuver through busted Spanglish at the very least. If you choose to take this mission, we ask you bring a ton of patience, humility, an open heart, and a little coin purse (for frequent tipping to local angels who inform you in times of need). Cuba is a nation of contradictions, but it is also a country full of unlimited potential and resilient people who make lemonade out of lemons. As the updated phrase is repeated often on the streets, “No es Fácil, pero no es Impossible.” It’s not easy, but it isn’t impossible.